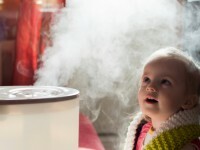 Humidifiers and HVAC (Heating, Ventilation, and Air Conditioning) systems can make life a lot more comfortable, but can also make us sick, according to several institutions, including the Mayo Clinic and Consumer Products Safety Commission (CPSC), who report that if humidifiers aren’t maintained properly or if humidity levels are kept too high, can grow and spread mold and bacteria that causes lung and respiratory illnesses, including Legionnaires’ disease. Humidifiers, whether portable or built into a central heating and cooling system, can ease a slew of problems caused by dry air, from dry sinuses to cracked lips. But without regular maintenance, bacteria, mold, and fungi often grow in tanks and on the filters of portable room humidifiers, or in reservoir-type HVAC systems. These toxins can be released in the mist that the machines emit. Breathing in harmful particles carried by the mist can lead to respiratory problems, including flu-like symptoms, asthma, allergies, and serious infection – even humidifier fever, a respiratory illness caused by exposure to toxins from microorganisms found in wet or moist areas in humidifiers and air conditioners – especially for those of us who already suffer from allergies. • Change the water daily. Empty the tank, wipe all the surfaces, and refill the water daily to reduce the growth of microorganisms. Using water with a low mineral content, such as distilled or demineralized water, will help reduce build-up of mineral scale and the dispersal of minerals and bacteria released into the air. • Keep your humidifier clean. A humidifier should be cleaned every three days, at least! Be sure to unplug it, and wipe down any deposits or film from the tank with a 3% hydrogen peroxide solution, disinfectant, or chlorine bleach and water mixture. (Follow guidelines recommended by the manufacturer for your particular humidifier.) Be sure to rinse the tank and surface areas after cleaning it. • Change humidifier filters regularly. People tend to wait until they can see signs of mold on the filter before they change it, which can be too late. Be sure to change your filter as often as the manufacturer recommends, or sooner if usage has been high. • Don’t try to keep your home too damp. An ideal humidity level is between 30 and 50percent. If you see condensation on surfaces, walls, or floors near your humidifier, you run the risk of breeding mold, bacteria, and dust mites. You can use a hygrometer to monitor humidity levels. It is not recommended that you run your humidifier round-the-clock. 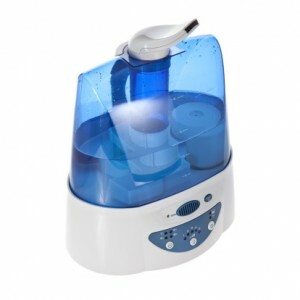 • Fully clean and dry your humidifier at the end of the season before you put it away. This will help to prevent mold and bacteria growth while in storage. 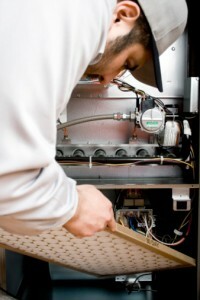 • Read the instruction manual or ask your HVAC specialist about proper maintenance for your unit. There are four main types of whole house units that have a variety of maintenance schedules and operations. • Be sure the humidistat, which controls humidity, is set between 30 – 45 percent. Anything higher than 45% and you risk mold and bacteria growth through condensation and particles settling in the bottom of ducts, which can spread spores through your entire house quickly. • Reservoir (drum) style humidifiers require monthly maintenance. This includes cleaning the foam evaporator pad, which should also be replaced annually. Clean the foam pad using a 1:3 solution of water to vinegar, or use a commercial calcium removing fluid. Soak the foam pad until the deposits dissolve. Rinse the pad generously with clean water. If the pad is ripped or does not come fully clean, replace the foam pad. With a little humidifier TLC, the air in your home or office can make it a happier and healthier place to live or work! Hey. I feel like my cool mist humy/diffuser may have caused me to have a sore throat. I clean it every 3 or 4 days buut not with peroxide . I use a Lysol bleach free multipurpose spray cleaner (not the aerosol, just the actual spray cleaner) which I probably shouldn’t do. However, I don’t always do it extremely throroughly like I snould. Is it possible that a sore throat could occur from a less than sanitized mist ?